There’s a swarm buzzing through Russian media. 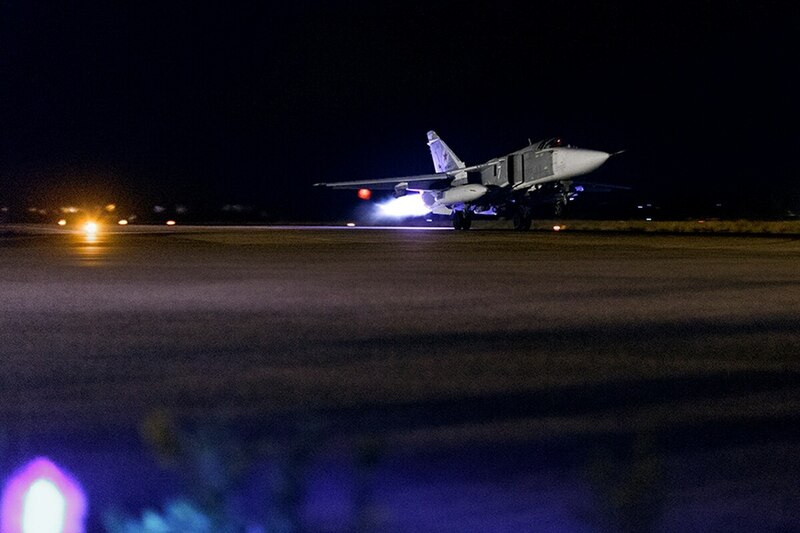 As part of the Russian government’s continued military support for Syria’s dictator, Bashar al-Assad, Russia operates military aircraft out of Hmeymim, on the Mediterranean coast. Hmeymim is 53 miles as the crow flies from Idlib, which remains outside the control of the Assad government. In the past week, that airbase has come under an aerial assault of its own: drones, sometimes in swarms, attributed to jihadist forces operating from the area around Idlib. Details about what kinds of drones, and to what effect they were designed for, are scarce in the open source, but there are a few things we can infer from how Russian media is talking about the attacks and the need for improved drone detection systems. On Aug. 13, Russia’s government-owned TASS news service reported that the Hmeymim airbase missile defense systems downed five drones, launched from insurgent areas. That’s the most reported in a single instance, but the attacks on Hmeymim have been coming since at least July 20, when TASS reported that over the previous two days, two drones had been detected and destroyed near the base. A TASS story published on July 30th reports that drones had been downed near Hmeymim on the July 27 and July 29 as well. On Aug. 9, TASS reported another drone shot down by Russian forces near Hmeymim, and again on Aug. 11, the news service reported yet another downed drone near Hmeymim. On Aug. 12, TASS reported Russian forces had shot down another two militant drones. All of these reports note that the drones caused no damage and no casualties were inflicted by the machines or in the process of shooting them down. It’s possible that more information will come out contrary to this point: nations waging counter-insurgency are not always up-front about what transpired. The stories repeatedly reference that the drones came from the area around Idlib, officially a “de-escalation zone” but also an area Russia bombed as recently as last week. In all six of the TASS reports on drones shot down around Hmeymim, a government spokesman describes the drones as shot down at some range from the base. Specifically, the spokesperson says “at a considerable distance from the base” on July 22, “at a safe distance from the airspace” on July 30, “shot down by air defense systems at a distance from the air base” on Aug. 9, “at a safe distance from the airbase” on Aug. 11, “at a safe distance from the base” on Aug. 12, and “the airbase’s missile defense systems downed these air targets at a safe distance from the base” again on Aug. 13. None of these figures give us any idea of the range of the drones, but the fact that drones built or operated by insurgents can repeatedly reach the airbase itself suggests that the “safe distance” may be closer than is comfortable for the Russian forces doing the actual defending. There are real obstacles to long-range interdiction of small drones. Compared to planes, drones like this are tiny aircraft, whose signatures are usually filtered out of normal air defense radar readings, less the radar return every flock of birds or a weather system as a threat worthy of countering. (This is hardly a problem for Russia alone; after Dough Hughes landed a gyrocopter on the Capitol lawn in Washington, DC in 2015, NORAD held exercises to train radar operators to identify the small crewed flying vehicles, and officials testified before Congress about the noise the shows up when training radar to look for smaller flying objects.) Most drones that can be purchased or assembled by insurgent forces are smaller than even ultralight gyrocopters, so traditional radar is likely to struggle to find the drones until they are close. That radar struggles with small flying objects is a problem compounded by the short range of other drone detection systems. A survey of counter-drone systems by Sandia Labs, conducted in 2015, finds most drone detection systems that don’t use radar to have a range of at most 1.8 miles or 3 kilometers, with many systems having a range as short as 3,280 feet or 1 kilometer. Another survey of counter-drone systems from 2017 finds a maximum range for detection by means other than radar at around that same two mile limit. There are dozens of drone detection systems on the market that use other means, like radio frequency, acoustics, visual recognition, and infrared sensors to discover drones, but without the added input of radar, all are limited to short-range detection. Even if the drones launched against Hmeymim airbase fail to cause a single casualty or destroy a single piece of military equipment, the drone attacks can be an ends unto themselves. If the drones carry cameras, they’re likely streaming information about the defenses of the base back to the people launching the attacks, making future attacks easier. If the attackers can get close enough to launch amateur or commercial drones, many of which have a range of around three miles, then the attackers are likely operating within the range of other cheap weapons, like Qassam rockets. If the drone attacks are not the prelude to any further action, there’s a chance that every single drone is significantly cheaper than the defenses used to take it down. If that defense is missiles, than the drone is almost certainly orders of magnitude cheaper. There is a special symmetry to attacks like this, and so long as the it is cheap to produce and use drones, then anti-air defenses built to counter jets and helicopters will be overkill for the kinds of aerial attacks they end up thwarting. As we saw in Venezuela, the threat of future drone attacks is often enough to provoke a reaction, even if the first attack failed to accomplish any traditional military objectives. Drones effective enough to spook militaries are simple to make and, thanks to the availability of cheap parts online, can be made even by nonstate actors as they suffer the onslaught of a large conventional military. After Ramadi was recaptured from ISIS in 2016, investigators found a drone workshop. The most elaborate parts of these drones, the gyroscopes, were traced back to online distributors in Turkey. It is unlikely to matter in the grand scheme of the conflict, but for the particular chapter of the war in Syria around Idlib, the availability of drone parts, and the ease at which those parts are turned into scouts or weapons, launched against fortified military positions, may provide the pretext used by the Syrian government and the Russian military to undertake further military strikes on the area. It’s a case already being made by Russia’s permanent mission to NATO.